Voluptuous design, relaxed and low, with beautifully curved trumpet arms and super deep seats to sink into. 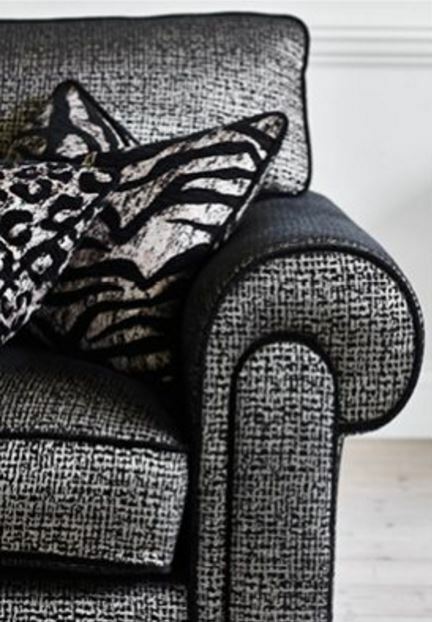 This dramatic fabric collection is opulent and bold, and there are lots of luxurious finishing touches, contrast and self piped detailing. The heavy ebony wood feet with a gentle metallic dusted finish add a dash of extra glamour. â€¢Feather/fibre seats as standard. Supalux foam also available. â€¢Feather filled back cushions, pillows and scatters. â€¢4 wood finish options: gold, weathered oak, black or black/white. â€¢Sofas available standard and pillow back. â€¢3 sofa sizes, 2 chair sizes and 1 fixed top stool. Back suspension: High resilience, elasticated, tensioned, webbed back. Wood finish: Gold as standard. Also available in Weathered Oak, Black or Black/White â€“ please specify. Options: 4 seater sofa permanently split. Sofas available pillow or standard back. Contrast or self-piping detail available â€“ please specify. Feet are removable.